I got this fajita marinade recipe from my college roommate waaaaaay back in 1985. It’s my favorite summer-time meal and I make it a lot. Which also means I think of my good friend Karla Oehlke a lot as well. We lost touch several years ago, but it’s fun to take a walk down memory lane every summer! 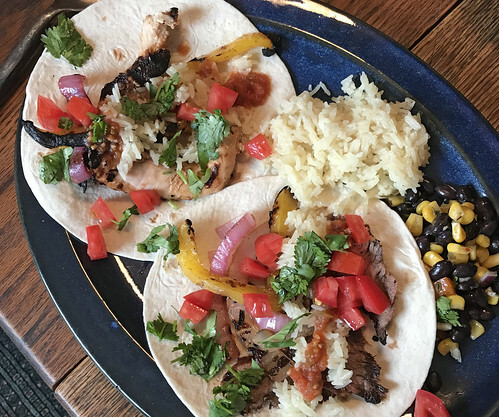 Fajitas seem difficult, but they’re not – they just have several accoutrements that make them time-consuming to make. Trust me though, it’s all worth it in the end, especially if you make extra to reheat throughout the work week. 2 Dz Flour Tortillas – plenty to make quesadillas with the leftovers! Made these for our football team’s end of season banquet, 150 people. I added some cumin and chili powder to the marinade. Marinated the meat for 24-hours. Also had refried beans and black beans and had a ground beef taco meat too. It was a big hit!